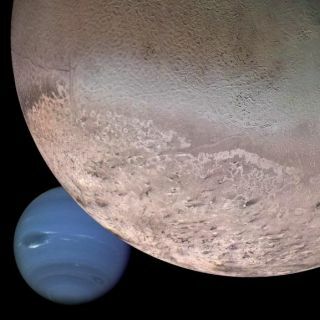 A montage created with data from the Voyager mission of Neptune and its moon Triton, which scientists consider a potential ocean world. As far as we know, all life requires one thing, water, and that's why scientists are fascinated by worlds they know or suspect host giant oceans: These worlds are among the best candidates for finding life beyond Earth. And in a new report, a team of scientists summarizes what we know about each of these potential "water parks" and our long-term options for furthering that knowledge with progressively more ambitious missions. The report is on behalf of the Roadmaps to Ocean Worlds group of NASA's Outer Planets Assessment Group, designed to inform a congressionally mandated research portfolio within the agency. Other promising candidates are Jupiter's moon Europa and Saturn's moon Titan, which each check a few boxes already. But even these worlds still pose very real puzzles to scientists, including whether their oceans would be at all habitable. And there are some enigmatic worlds where scientists aren't even sure yet if water is on tap. When it comes to destinations like Triton, Ceres and Pluto, scientists have only tantalizing hints that they could be wet. But the team of scientists was also careful to express support for studying the whole range of potentially watery worlds, even those about which scientists are currently less sure. After all, we don't have any sign that those worlds are fruitless places to look — we just have much less information about them so far. And there's one other planetary body that the scientists want us to study: Earth. That's because while our ocean is unlike any other that we think may exist in our solar system, it will always be the easiest one for us to study.